According to figures from ARIA, the market is up 5.5% in 2016 after generating AUS $352.2m (US $269.7m) in revenue. Growth is attributed to a 90.5% surge in streaming revenues across paid and free tiers. The lion’s share of that rise is from income earned from paid subscription, which rose 133% on 2015 to AUS $108m (US $82.7m). After a 179% surge in 2015, income from ad-funded streaming (that covers YouTube, Vevo and Spotify’s free tiers, alongside non-interactive offerings from the likes of Pandora) was up just 12% to AUS $28m (US $21.4m). 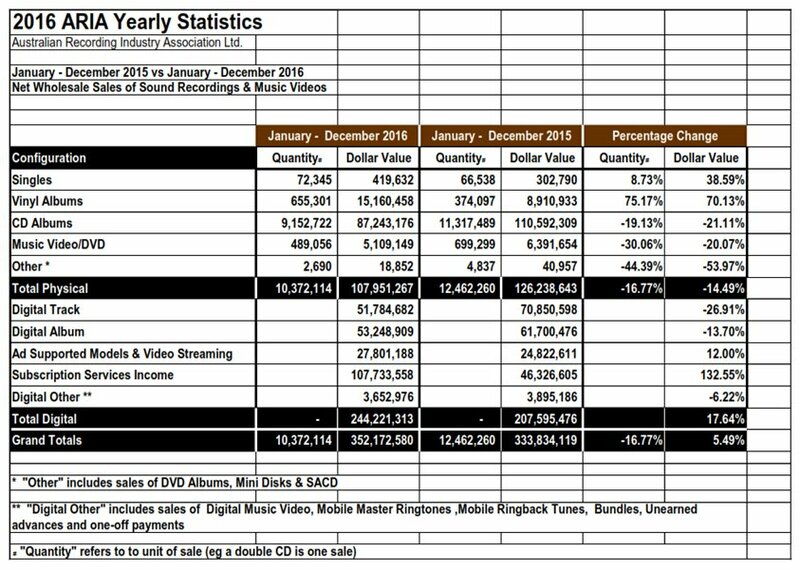 Music streaming revenue has become the dominant consumption format for Australian music fans, now accounting for 38.5% of overall market by value. The streaming growth fuelled an overall 17.6% increase in total digital market, totalling AUS $244m (US $186.8m). Digital sales now account for approximately 70% of the total market. 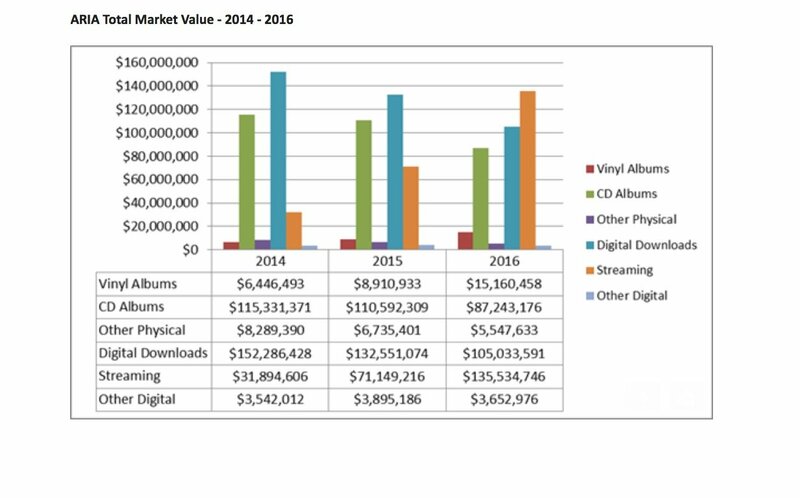 Revenues from physical formats reached AUS $107.9m (US $82.6m) – 30.6% of the total market. Vinyl rose for the sixth consecutive year by 70% to over AUS $15.1m (US $11.6m) in value. The total $352.2m figure is up from AUS $333.5m (US $252m) in 2015 – a year which saw a rise in revenue by 4.94% after a 10% decline in 2014. Australia’s market value is worth just over two thirds of what it was a decade ago, when revenues tipped AUS $511.8m. ARIA’s numbers count the amount of money that came through the door at record companies after retail and other expenses are deducted. Denis Handlin AM, ARIA Chairman and Chairman & CEO Australia & New Zealand and President, Asia, of Sony Music Entertainment, said: “The industry is delighted to achieve continuing growth in 2016 building on the positive results from the previous year. “This is a reflection of the industry’s innovative marketing and high level of artist development, as well as the further consumer take up of quality digital retail services. 2016 was a good year for local artists on the ARIA Charts with a record breaking 20 Australian artists scoring No.1 albums. Dan Rosen, Chief Executive Officer ARIA, added: “The continued growth that we have seen in 2016 is a testament to the ongoing creativity and resilience of our local industry. “To think that the dominant form of our revenue is now derived from a category that did not exist five years ago demonstrates the innovative nature of the Australian music business. “Record labels have done a great job in supporting their artists while embracing the multitude of ways consumers can legally access the music they love.